Tyrollean Makes the Red River Gorge SPI Assessment a Go! 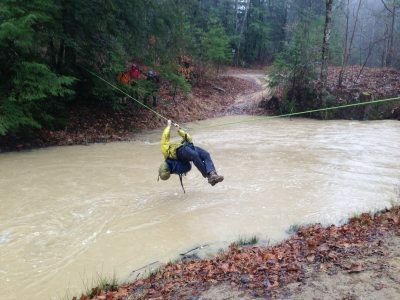 The AMGA Single Pitch Instructor assessment that was just taught in the Red River Gorge was a full-conditions course. Karsten had to set a tyrollean over the river because there was so much rain on the first day that there were flash floods! Find out More about our AMGA SPI instructor programs.